Last month in northern Palestine brought stories of Israeli settlers from the illegal Yitzhar settlement that, however horrifying, all suffered an important shortcoming: the scope of the stories lent to individual scapegoats, and in doing so provided a vivid, but ultimately penny-deep look at the Palestinian condition. Today’s news is flooded with such dramatic examples. This past month, I lived in and began to learn the story of Um al-Khair, a Palestinian Bedouin village in the South Hebron Hills. Again the case presented a challenge of conveyance – perhaps even more so. While it’s certainly every bit as troubled as the villages in the shadow of the Yitzhar settlement, Um al-Khair’s story is much less made for TV than the photogenic, headline-grabbing brutality of physical violence. 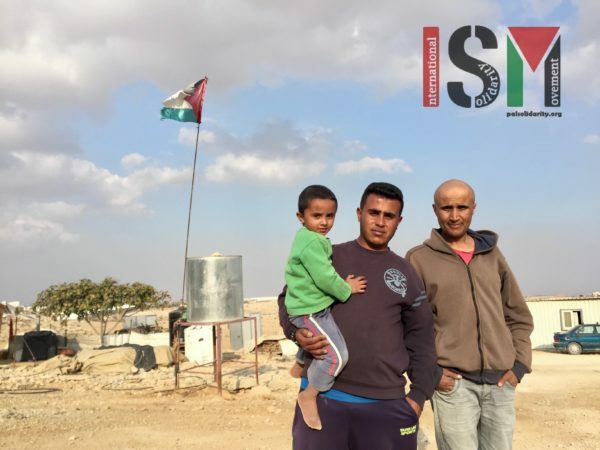 There’s no getting around it: it’s a small village, and reversing the injustices there wouldn’t move the needle on injustice in Palestine a whole lot. However, it does offer itself as a worthy placeholder – an exemplary microcosm for the nation of Palestine, and what happened, is happening, and will happen to it if nothing is done. Tariq (left) and Eid Hathaleen, with Tariq’s nephew Muhammad in his arms. 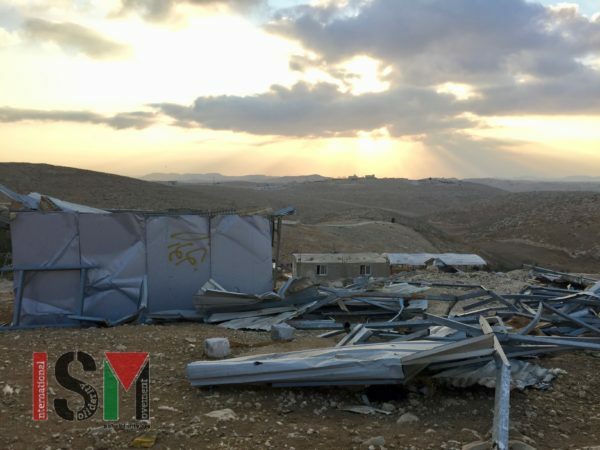 Tariq’s house, which he shares with his mother, has been demolished 3 times already (’08, ’12, and ’14). Eid recently had both of his cars, one less than a week old, confiscated by the Israeli army. A tattered – but still standing – Palestinian flag waves behind them. As it turns out, the soldier didn’t have to. Seventeen years later, the pen would prove mightier than the sword, and the true kneecapping of Um al-Khair would come not in the form of an excessively forceful soldier, the optics of which might provoke international outrage, but rather bureaucratic, pseudo-legal land-grab policies. To that end, in the 17 years since the martyrdom of Muhammad, by far the most high ranking targets of the Israeli army in Um al-Khair have been peaceful, inanimate objects – their traditional Bedouin oven, among the kind of objects Pierre Nora coined “les lieux de mémoire” in 1989, as well as a proposed community garden – the first of which has been built or rebuilt and subsequently destroyed 3 times over, and the other disallowed before construction could even begin (though there’s an international campaign to support it anyway). The future of Um al-Khair. 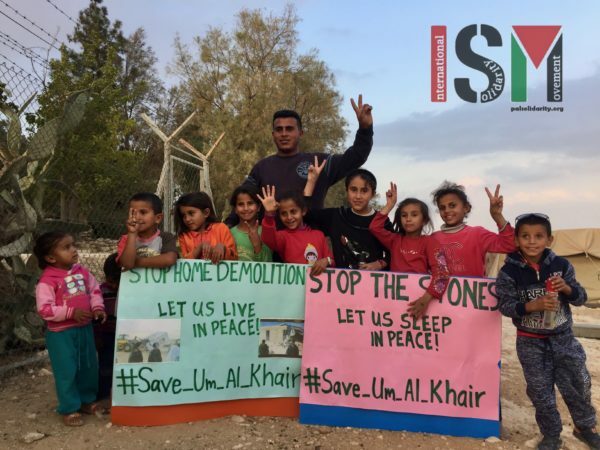 Their demands are simple: to live in peace, which means an end to the ongoing demolition of their homes, as well as an end to settler violence against them during the night. Clearly the real threat isn’t any one person, but anything palpable for Palestinians to hold on to, and with it the motivation to continue resisting. Homes, homelands, even ovens and community gardens are brought to ashes – as Israel admits with shameless candor – to make room for people of a different ethnicity. Taken together, what happened to Muhammad the individual and what’s happening to Um al-Khair’s lifeblood structures span the spectrum of violence, from physical to structural. Though they’re specific to Um al-Khair, they speak volumes about the post-1948 Palestinian story. The notion that a bread oven or community garden could be threatening should be preposterously silly and, at the same time, make all the sense in the world when the very acknowledgement of a Palestinian people is threatening to an ideology whose implementation required their ethnic cleansing. After all, one of the most repeated go-to’s for stewards of Zionism – that Palestine was “a land without a people” – reveals itself as the only option short of confronting the question of what happened to those people, and who was responsible. The result was that incorrect and racist revision: pre-1948 Palestine – a rich bastion of culture, cuisine, art, music, academia – was really a land of zero cities. After all, it didn’t even have a people. Suleiman Hathaleen, the elder in Um al-Khair, himself 6 years older than Israel. Born in Arad, Palestine (now Arad, Israel), he was made a refugee in 1948, and has lived in Um al-Khair since. Of course, any rational person knows that Palestinians do exist, and that they didn’t come to Palestine simply to meet the arriving Jewish immigrants with weapons. Sentient, living evidence for this – for the bustling Palestinian society and what happened to it – exists in refugee camps in- and outside of Palestine to this day. 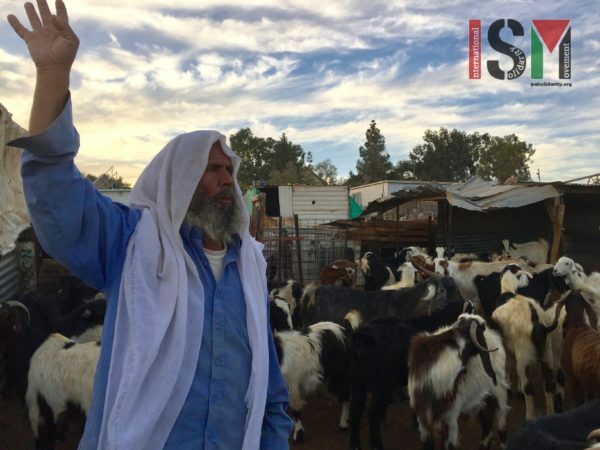 Since 2007, roughly 20 families from Um al-Khair have joined them, after the State of Israel – not a rogue extremist, not an individual settler, but the real-life manifestation of Zionism – has come to their village to make them homeless. 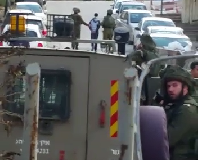 This, unfortunately, is what defines the struggle at large for many indigenous Palestinians – to stay and survive at all under the threat of expulsion and extermination. 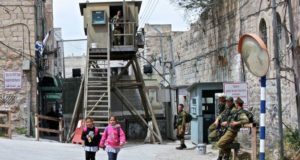 There’s been virtually no evidence even of an attempt to maintain a second-class, exploitable Palestinian population, making this – what’s occurring in the West Bank and Gaza as opposed to the State of Israel – not apartheid, but unvarnished ethnic cleansing. The ruins of a family’s demolished home in Um al-Khair. And so, ceding for a moment the possibility that Um al-Khair’s situation is controversial, the fact remains that the international community has yet to be told what justifies it. What justifies the fact that the people with the deed to the land, who’ve lived completely without sin and within the law, are forced to stand there crying out for help, physically weak from humankind’s deepest sadness – the gutting, emptying kind that you feel in your body – as a Caterpillar D9 military bulldozer thunders to life and starts towards their home.